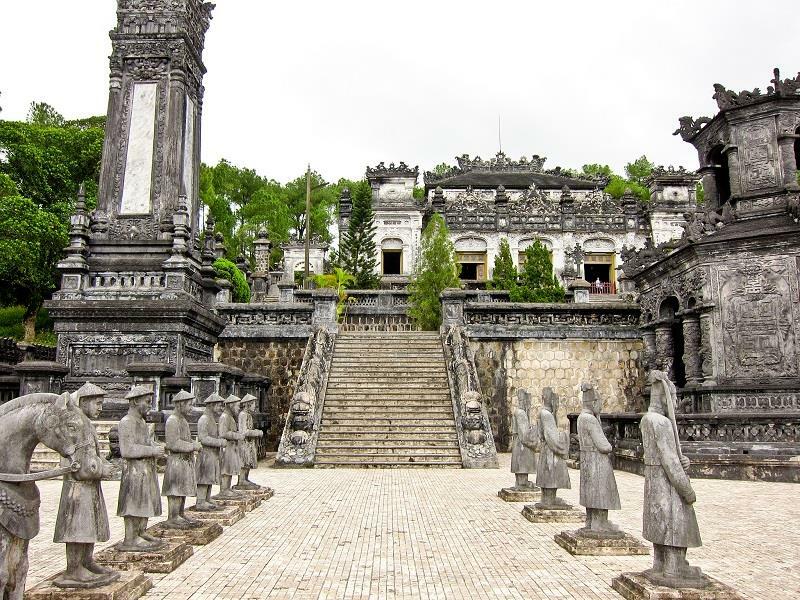 Thua Thien - Hue is home to numerous tombs of Nguyen Dynasty's Kings which are recognized as world heritages by UNESCO. Contributing to the common art treasure of humanity is the system of tombs and mausoleums with abundant styles expressing Emperors' characteristics. Currently, compared to other mysterious tombs in Vietnam, Tomb of Khai Dinh has been relatively intact and owned a unique architecture. 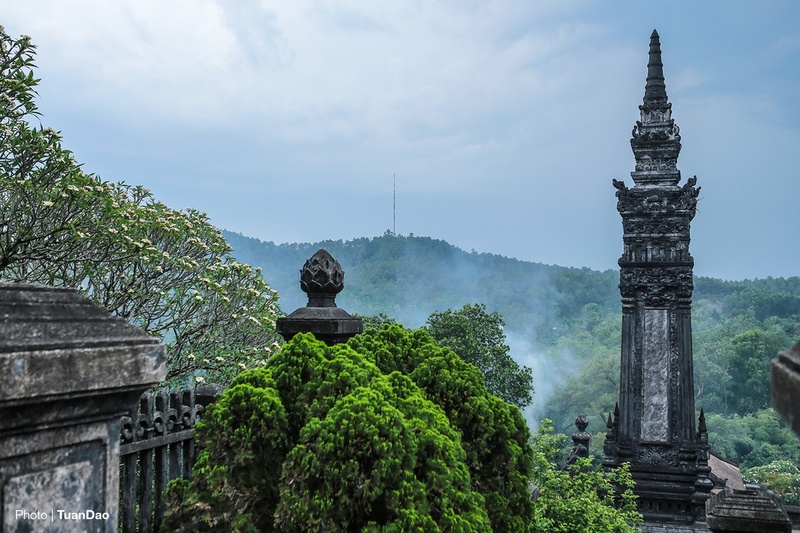 Emperor Khai Dinh decided to locate his tomb imperial at the foot of the mountain Chau Chu, 9 kilometers south of Hue city. In comparison with the rest of imperial tombs, this imperial tomb is small in extent, little more than 5600 square meters; however, its construction, decoration and details are very elaborate. Khai Dinh became the Emperor of Vietnam in 1916 at the age of 31. Right after taking the throne, he built many palaces, buildings, and royal tombs for himself and his own imperial clan, such as Kien Trung Palace, An Dinh Palace, Trang An Gate, Hien Nhon Gate, Chuong Duc Gate, and especially Ung tomb (former Khai Dinh Tomb). Compared to tombs of previous predecessor Emperors, namely Gia Long Tomb, Minh Mang Tomb, Tu Duc Tomb, Dong Khanh Tomb, Duc Duc Tomb, Khai Dinh Tomb covers an area of much more modest, with dimension of 117m x 48.5m whereas extremely elaborate and time consuming to complete the tomb. In detail, it took 11 year to finish the tomb. Unlike Tomb of Tu Duc bringing the atmosphere close to nature, as a watercolor painting, Khai Dinh Tomb when newly accomplished was compared as a colorful, magnificent and extremely showy cage. Yet, fine art and painting studies today must take their hat off before the architectural sculpture quintessence reaching sophistication in lines, and harmony in layout to build a magnificent tomb. This turns the tomb into a masterpiece stretching Vietnam history. The location of Khai Dinh Tomb was carefully calculated. Accordingly, the position of hilly mountains, streams around the tomb were relative with the geographical feng shui elements, creating majestic and breathtaking natural scenery. Architecture of the Tomb of Khai Dinh was extremely strange, far different from structures of previous predecessor Emperors' tombs. Talking about feng shui, this area was an ideal land to build the tomb. Particularly, Thien Dinh Palace was in the highest position and the main architecture of the tomb. It consisted of five consecutive parts tightly incorporating together. The 2-side rooms were for guard soldiers. 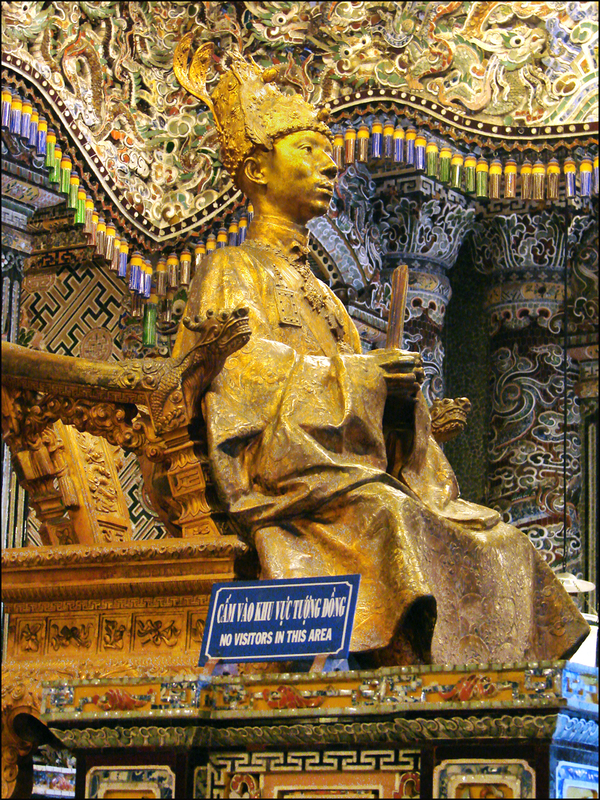 In front was Khai Thanh Hall retaining the altars and portraits of Khai Dinh Emperor. In the middle was the burial area with the emperor statue on the top and deep down below was the grave of Khai Dinh Emperor. In the rear was the altar of Khải Định Emperor. The tomb remained a high slope. From the street to the main palace was a floating rectangular blocks up to 127 doorsteps. In particular, Khải Định was very fond of foreign elements. He specially enjoyed the beauty of modern Western culture. In populations of tombs, Tomb of Khai Dinh was built with cement and steel, meanwhile the others were implemented with mortar and masonry. There were two houses for civil and military mandarins; yet, the king had died when the building was on the way to be finished. The tomb was completed by Emperor Bao Dai, Khai Dinh's successor in 1931. This was the oldest lasting building and also the last royal tomb constructed in Nguyen Dynasty. The system of Khai Dinh Tomb completed 83 years ago, so far it has been still relatively intact. 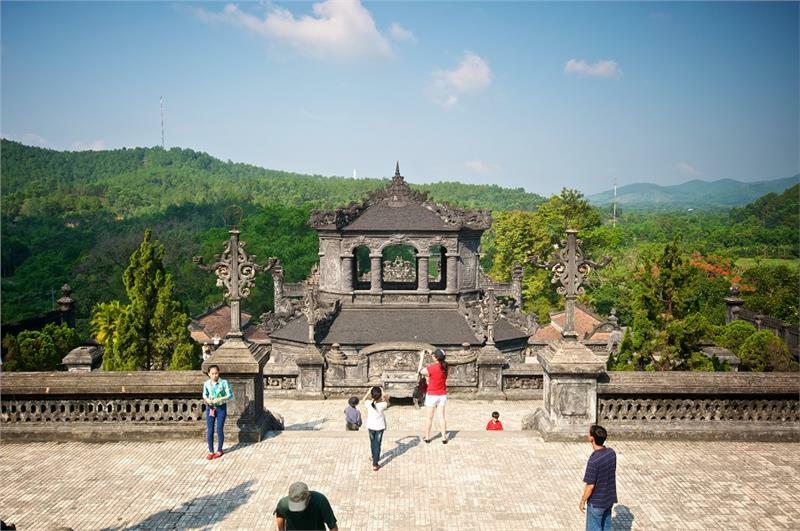 The most artistic values and excellent features of the tomb are Thien Dinh Palace, the burial place of King Khai Dinh's corpse, the last part of the complex Khai Dinh, to the top of the Imperial Tomb, where we can see the sarcophagus of Emperor. The primary responsibility to create the perfect work of art in the Thien Dinh Palace was Pham Van Tanh artist, author of 3 murals “9 dragons hidden in cloud), the biggest murals in Vietnam. It was decorated the ceiling of three halls in Thien Dinh Palace. This Palace of the imperial tomb is formed by several ranches communicated among themselves, where the main hall contains a statue of the seated Emperor Khai Dinh upon his throne and at his feet, his sarcophagus. The decoration is made with stained glass and mosaics built ceramic based broken into pieces. As a curiosity, we know that the sun is directly behind the statue of the emperor, the emperor's death represents. In the room next to the sarcophagus room, we have a statue of Emperor Khai Dinh, scale, made ​​of bronze. Tomb of Khai Dinh is the pinnacle of visual art on porcelain and glass. It is actually a valuable work of art and architecture. Tourists once participating in Hue tourism in general and Khai Dinh tomb in particular will actually get unforgettable memories. Khai Dinh had a close relationship with the French occupiers, who did not like nothing to the Vietnamese people and behavior which earned the Emperor Khai Dinh the nickname of French employee. Khai Dinh died at age 40 of tuberculosis, which his son had to finish the construction of the Imperial Tomb Khai Dinh. The cost of construction of the Imperial Khai Dinh tomb was such, that the Emperor raised taxes to the Vietnamese village by 30%. Ceramics in the Imperial Tomb of Khai Dinh Hue The imperial tomb of Khai Dinh is so elaborate and with so many details, Khai Dinh , he had to go to the French to buy steel, iron, cement and tiles. The emperor also sent ships to China and Japan to achieve ceramics and stained glass needed for the Tomb. 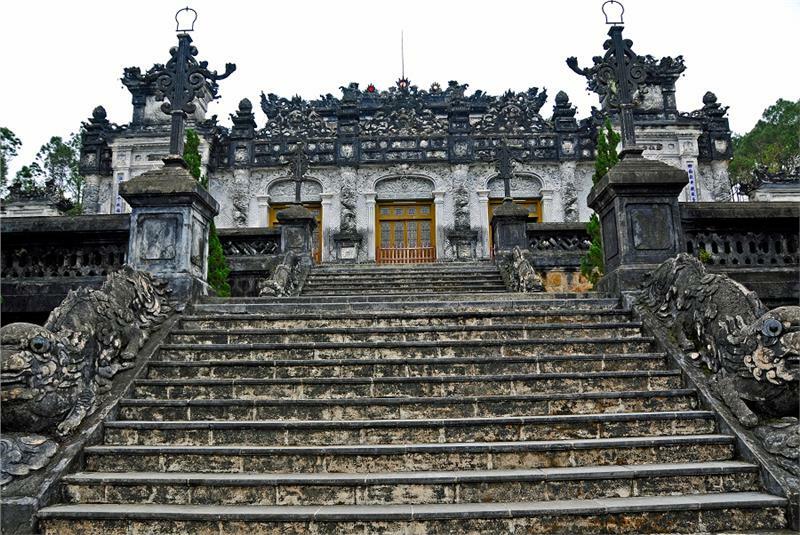 The imperial tomb or monument, as we see it, the Emperor Khai Dinh is located 9 miles south of the city of Hue. We can only get there by land to the Imperial Tomb of Khai Dinh, recommended with a car, following Highway 49 for 9 miles. Open hour: Khai Dinh tomb is open daily from 7: 00 to 11: 30 and 13: 30 to 17: 30 hours. Entrance pricing: Entrance to the Imperial Tomb Khai Dinh, like the rest of most tourist imperial tombs of Hue, has a price of 80,000 VND (about 3€ , see Vietnam currency).